Definition at line 95 of file vm.h. Definition at line 227 of file vm.cc. Definition at line 231 of file vm.cc. Definition at line 235 of file vm.cc. References d, size(), VarSet::Private::vect, and VarSet::Private::vMap. Definition at line 250 of file vm.cc. References d, Var::name, VarSet::Private::vect, and VarSet::Private::vMap. 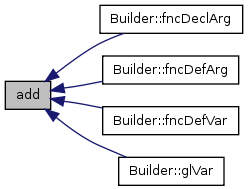 Referenced by Builder::fncDeclArg(), Builder::fncDefArg(), Builder::fncDefVar(), and Builder::glVar(). Definition at line 265 of file vm.cc. Referenced by chkUnused(), VmRunner::Private::chkUnusedGlVars(), CallCmd::exec(), Builder::fncCall(), operator=(), operator==(), and operator(). Definition at line 269 of file vm.cc. References d, size(), and VarSet::Private::vect. Definition at line 274 of file vm.cc. Definition at line 109 of file vm.h. Definition at line 114 of file vm.h. Definition at line 119 of file vm.h. Referenced by add(), operator=(), operator(), size(), and ~VarSet().